A few months ago, a blogger friend of mine asked me if I wanted to buy their trailer bike. I had been thinking of looking for one since I thought Linnaeus would be ready for one soon--perfect timing! 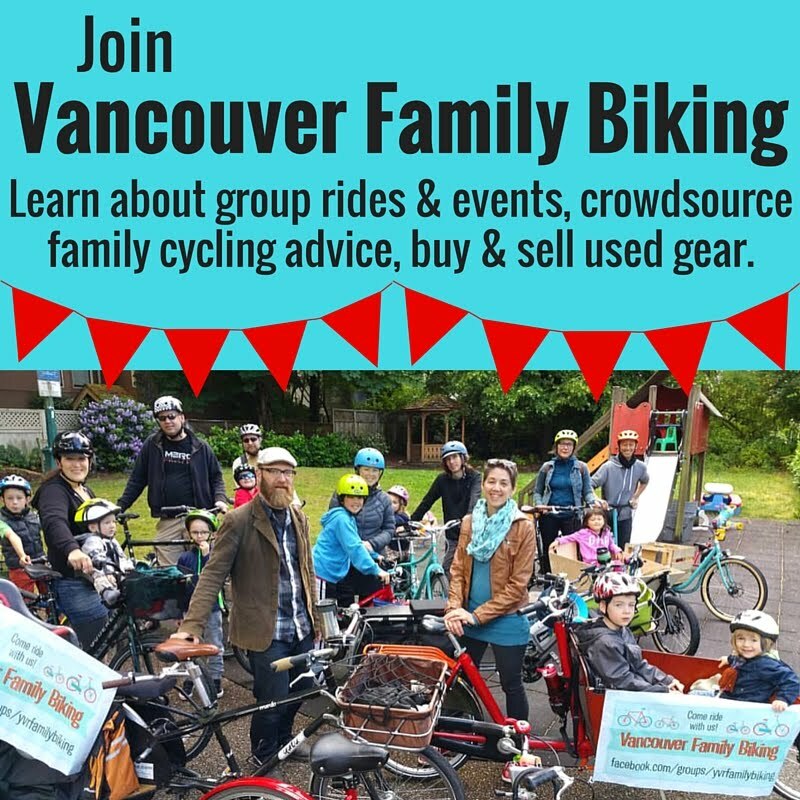 She sold us the bike for a good price (it's one of these folding kind, usually $280) including pedal blocks & fenders, but minus the hitch, since they wanted to use their other trailer bike on both parents' bikes. After picking up two hitches of our own at The Bike Doctor, we were all set. That was last winter. This past weekend--pretty much the eleventh hour, as Linnaeus has outgrown both the weight limit & the leg length for the iBert--I finally got around to installing the hitch, hooking up the bike & taking it for a spin around the block a few times. Because the bike attaches to my seat post, the balance will take a little getting used to, but Linnaeus was comfortable & happy on there. We give him a hand climbing on, but that's a lot easier than lifting all 36 pounds of him & trying to wiggle his big feet under the handlebars in the iBert. Oliver took him for a ride to a park--probably about 3 km round trip--which went well. Hardly any wobbling, & he's started keeping his feet on the pedals. Linnaeus now calls it his 'one wheel bike'. How did you like your new Trail-A-Bike?Good. Can you tell me about it?My trailer bike has one wheel. It has pedals. What did you do on the bike?I rided on the bike. I goed to the park. And Papa showed me something. We went fast. 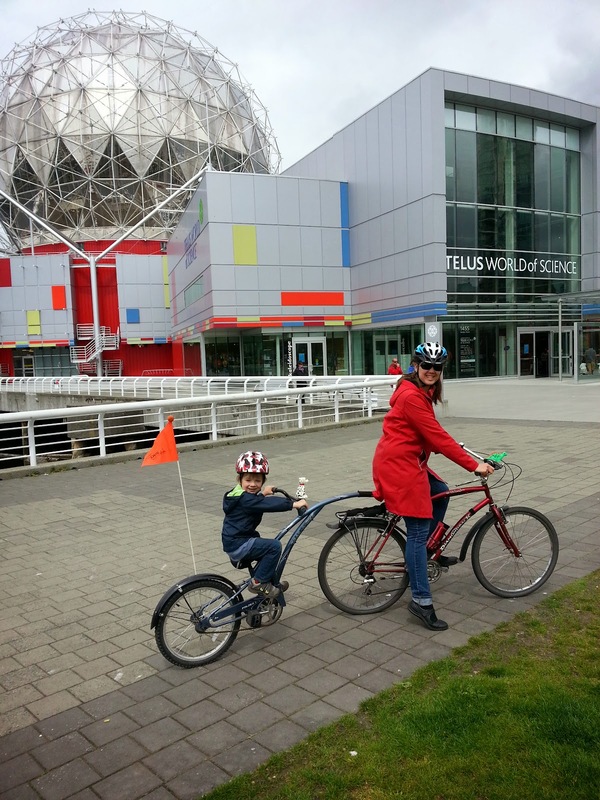 Monday we rode the Trail-A-Bike to Science World, about a 15-minute trip from home. I found it even easier to use when riding faster, but still could feel the trailer pulling at my seat post at the slower speeds as we were riding uphill home. I think because the attachment point is so high--just under my seat--that it might always feel that way. What's changed is how comfortable I am with it. Definitely feels less disconcerting now & I don't think that the wobble is enough to unbalance me. I'm happy that Linnaeus took to the Trail-A-Bike so easily. I think it'll be a good choice for us until he can ride farther on his own. We often bike 10-12 km round trip for picnics & other outings--way too far for a little kid on their own bike. The Trail-A-Bike is going to be a great way to get him to preschool or to the local waterparks in the summer. We loved our trailer bike. It's led (eventually) to some great long bike rides though there was a year or so of resistance to having to pedal one's own wheels. We have awesome memories of the Pemberton Slow Food Cycle by trailer bike. Have an awesome summer! Thanks for the heads up. ;) Looking forward to the summer, definitely!